The Scuola di San Rocco played an important role in the history of the city of Venice, especially for the care it offered the sick during epidemics. From the fourteenth century onwards, when the plague struck, the Venetians prayed to San Rocco (St. Roch). The Confraternity and the Scuola Grande di San Rocco was established in 1478. In 1484 Venice was hit by a severe outbreak of the plague and this led to the idea of bringing the remains of St Roch to the city from Voghera where they were said to have been buried. This took place in 1485. In 1517, after the Saint’s bones had been moved various times, a decision was made to build a new church in the Frari district to house them. The school was built next to it and in line with the traditional model of Venetian schools, it consisted of a main block with two large halls, one directly above the other. On the Ground floor, there is the Sala Terrena and above that, a single space upper hall, designed to hold meetings of the Capitolo (Chapter), and therefore called the Sala Capitolare. To the side of this hall is another smaller room called the Albergo (Hotel) where the regular meetings of the confraternity council, known as the Banca, or Bank, are held. The two halls are connected by a grand staircase that replaced the original stairs which were built before 1525 and later demolished. During the sixteenth century, the Scuola di San Rocco cemented its prestige by giving commissions to some of the great masters, such as Jacopo Robusti - better known as Tintoretto - who worked in the School between 1564 and 1588. Up until 1937 the halls were lit by natural light only, when Mariano Fortuny, the inventor of indirect light for theatres, was asked to illuminate the School. During the nineteenth century, both John Ruskin and Henry James commented on how dark the Scuola Grande di San Rocco was. Any attempt to improve the artificial lighting, from the early twentieth century onwards, was severely hampered by the fact that the systems could not be altered and the lighting and relative levels of infrared and ultraviolet radiation could not be reduced. The advent of LED light sources that are significantly more compact, easier to control and have lower radiation levels, finally meant that a new lighting system could be installed in the Sala Capitolare, where Tintoretto painted scenes from the Old Testament on the ceiling and scenes from the New Testament on the walls. The main objectives of the new lighting system designed by the architect Alberto Pasetti Bombardella, are to conserve the artworks, while offering a new experience of them that includes the chance to enjoy an overall view of the room. To achieve this, the project was divided into two macro spheres of intervention: Tintoretto’s great paintings plus the wooden and stone artworks, on one hand, and the hall’s architecture and decorations on the other. The new system has three main installation areas, two of which already existed: the interiors of Mariano Fortuny’s historic floor lamps and the floor next to the altar railing. To light the large, vertical paintings, the stone mullioned windows and the wooden allegories a new linear and longitudinal position has been added (for a special product with specific optics) above the ridged wooden panels and below the large paintings on the wall. All the new elements blend into the hall’s architecture and decorative features to minimise their visual impact. Luminaires have been selected with optics that are suited to the size of these great paintings and with spectral characteristics that bring out all the chromatic and figurative beauty of the Venetian master’s highlights and brushstrokes. The light flows point upwards to avoid troublesome reflection effects and light veil phenomena. The decision to install miniaturised electrified tracks on both the longitudinal sides of the hall has allowed new luminaires to be installed and concealed at an intermediate height just under the large Tintoretto canvases depicting scenes from the life of Christ. 2 For this installation, iGuzzini has specifically designed an extruded aluminium luminaire with elliptical optics and relative accessories to distribute the light flow over the entire pictorial surface with a semi-grazing effect. To increase the visibility of the thirteen paintings with biblical themes on the ceiling, the lighting has been reinforced by inserting View projectors in Mariano Fortuny’s historic floor lamps. 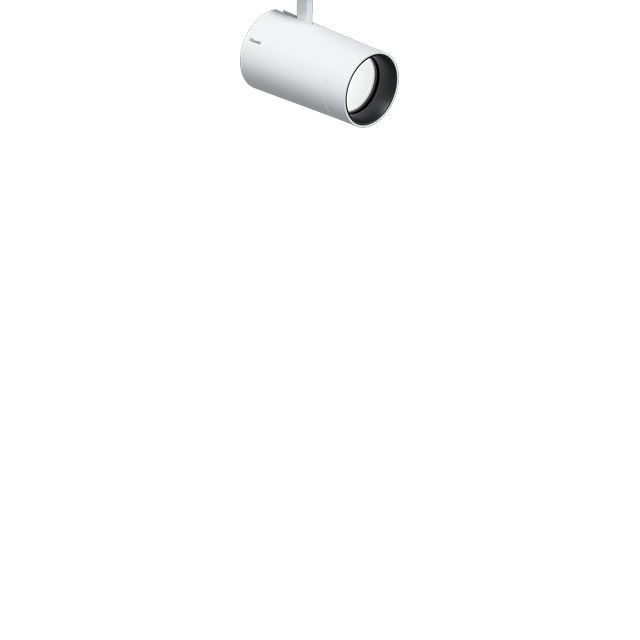 The rectangular version of the projectors, fitted with Opti Linear optics, are aimed at the ceiling and provide indirect ambient lighting. The round version, on the other hand, fitted with Opti Beam optics provide precise accent effects with 16°, 28° and 46° optics, chosen according to the size of the works to be illuminated and the distances between them. To improve the perception of the wooden allegories by Francesco Pianta, precise and delicately balanced light flows have been used with criss-crossed focuses that enhance the expressive, three-dimensional nature of the figures represented. To obtain this effect, the previous incandescent lighting has been replaced by accent lighting. This is created by very small Palco projectors mounted on a Low Voltage track supported by brackets that detach it by about 45 cm from the walls and with criss-crossed beams to emphasise the plasticity of the sculpted wood. The cabinets on either side of the altar are lit by a floor-mounted double light flow system consisting of: Palco projectors with 42° optics that create a diffuse veil of light over the entire vertical surface. This is combined with an accent effect on certain specific areas by Palco Framers shaper spotlights, also mounted on the Low Voltage track, to enhance Giovanni Marchiori’s bas reliefs on the doors. The historic lanterns that hang around the perimeter of the room are a characteristic feature of the architectural context and have therefore been kept, The traditional light sources inside them, however, have been replaced with specially designed circular lamps featuring an opal screen and RGBW technology. The white light they emit corresponds to a very warm, 2500 K, colour temperature to evoke a candle effect, while coloured light is used only during special events or ceremonies. In the rest of the room, to light the works of art, two different colour temperatures have been chosen with a colour rendering index of over Ra 90. To enhance Tintoretto’s paintings and the golden ceiling, the colour temperature of 3000 K, officially recommended by the Ministry of Cultural Heritage and Activities, has been used. Whereas on the dark wood details, where there is no gold leaf or light colours, a temperature of 2700 K was chosen to emphasise the plasticity of the sculpted wood. The light scenarios for the hall are managed and controlled by a DALI protocol digital system that allows a flexible level of light intensity to be created by both the individual light points and the luminaires that are grouped together for homogeneous areas. This means that the artworks and decorations can now be viewed and interpreted in new ways thanks to differentiated power ups.